Are you real? It was a question sparked by the picture book There’s a Tiger in the Garden by Lizzy Stewart that started our primary school library club thinking about their own existence. And then Steven Hawking died, and it was time to revisit questioning the universe and the role we play within it. So Christopher Edge’s latest book seemed ideal as the next book to watch out for. Coming after Albie Bright and Jamie Drake, Maisie Day is the newest addition to Edge’s range of books that deal with complex scientific questions and weave them into a children’s story. And perhaps, not just the newest, but the most sciencey and yet mystifying of the three so far. Maisie wakes on her tenth birthday busting with excitement and anticipation. But this child genius finds herself in an empty house. Not only have her family vanished, but outside the window what should be a sunny garden soon turns into an all-consuming blackness that is gradually expanding, and even entering into the house, swallowing the materials around it as it does so. Nightmarish doesn’t do justice to the sheer terror of this. And yet, alongside this horror story (in alternating chapters) is the somewhat happy story of what does happen on Maisie’s birthday – the food preparations for the party, a normal family life revolving around her. Luckily, Maisie is not only insightful, but a scientific whizz, and so she must use her knowledge of the laws of science to outwit the blackness, and return her state of being to the Maisie in the ‘happy birthday’ chapters. 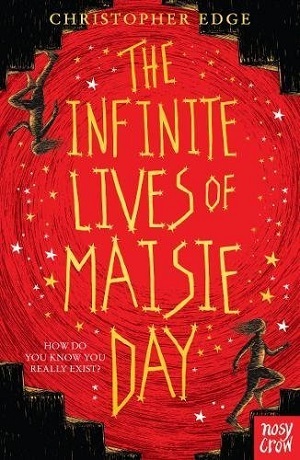 This is an intelligent and challenging book with oodles of science written into Maisie’s thought process. For some, perhaps even a little too much, and this is hard science. Luckily, Christopher Edge has a good handle on it, and manages to convey most of it in an easy to understand and genial way. There’s a terrific plot twist near the end that tries to explain, or rather question, the reality of all that we see around us. What it means to be human, to be real, and what our lives really are all about. Involving virtual reality, and the means by which we understand our universe and place within it, this book holds difficult concepts, but within short bitesize chapters, and an easy-to-understand narrative. Gratifyingly, the book features not just a female lead in Maisie, but also an older sister who is crucial to the plot, and so fits well into the current ambition to pull more girls into science and computer related subjects. This is an unusual book, very different to other novels for this age group (8+ years), and is short and accessible. This helps the reader to absorb the science whilst not getting lost in the plot, and this is some achievement. From black holes to expanding universes, sibling rivalry and electric endings – this is an intriguing and accomplished book.You can buy it here.